• What is Astrology For? It occurs only to a very few people to ask this question: "What is the real purpose of astrology?" The difficulty arrives when a person decides to see an astrologer for a consultation, and this basic question about what astrology is "for" hasn't been completely addressed. If a person is studying, practicing, or merely reading about astrology, they may take for granted that astrology is a way of predicting future events, or determining the best time to get married, start a business, invest some money, or when to act in a number of other areas. Still others are eager to uncover their psychological problems to know more objectively the weakness or strengths of their character. They want to discover what makes people behave or feel the way they do. They want to understand themselves better. Looking more closely at these two broad views of astrology we can see that what is sought after in both cases is a knowledge of what is around us and the anticipating of what is going to happen when various factors in our environment act on each other. In our current culture "reliability" in knowledge is thought to best be attained when working with external facts and material substances. By many, this is referred to as statistical knowledge. Whatever method of reliability is being pursued, it is often said — "knowledge is power". The idea of this statement may be quite evident at first glance. However, the usually unasked question is: Why is power valuable — or what is the value of what this power will be used "for?" In today's world many individuals, while fascinated by astrology, are asking for something that statistical knowledge can't give them. What many are seeking is a "way of life" in which our relationship as an individual to the universe could be given a constructive meaning. They want not so much to know the "how," as to know the "why" of their existence. What is sought after is why the power of knowledge has value, and what it is to be best used for. They want to think, feel, and be whole while discovering to how best to achieve this. This is the very essence of holistic astrology symbolism and gives rise to the sense of wholeness within all cyclic structures. We can see an interesting separation in the psychology community when looking at the differences between depth-psychology and experimental psychology. The face of analysis and classification become the working foundation after the separation of the intricate processes occurring in the physical body (especially within the brain and the nervous system). By the careful study of these separate parts there's an attempt to learn how these processes operate and relate to both conscious and unconscious reactions. This is done by using ingenious instruments and setting up complex and largely artificial experiments with animals and human subjects. On the other hand, the second face, representing depth-psychology, is a purposive type of psychology — a "healing way." It is meant to reveal powerful archetypes and to evoke a "function of reconciliation," an "image of salvation" so to speak. It allows the unconscious powers within the person to release their "message" to the consciousness, often through dreams or other closely related psychology material. The basis of this type of psychology is to introduce a subliminal language, a language of images rich with symbolic meaning. Jungian psychology in its deepest sense is a symbolic language. It doesn't have to claim that planets exert direct "influences" upon man through mysterious rays; but assuredly, in this modern era of science, man is "influenced" by the ever changing "fields of force" within which the earth, the solar system, and the galaxy exist. 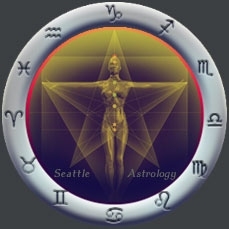 Focusing on the natural correlation between psychology and astrology, the opposite can be said of an astrological approach of analyzing day after day, year after year how the positions of the various celestial bodies are related to a birth chart and to deduce from this what will most probably happen. Where this approach might be intriguing, this is not the essential purpose of astrology. The purpose of astrology is not to tell us "what" we will meet along our journey, as it is to suggest "how" to meet it — and the basic reason for the meeting. Which quality in us, which type of strength is needed to go through any of the specific phases of our total unfoldment as an individual person. This has little to do with whether the events or the persons met during this particular phase are said to be "good" or "bad." What is important is not the event — any event — but whether or not we are able to meet it with best results in terms of our growth. We live in a dynamic and changing world environment. There is a cosmic order of rhythm and motion which interpenetrates and integrates all parts within the great whole of the solar system — the movement of Wholeness.